We all identify with the Norwegian people today. We hope that they will be able to keep two of their most admirable qualities - idealism and stubborness. 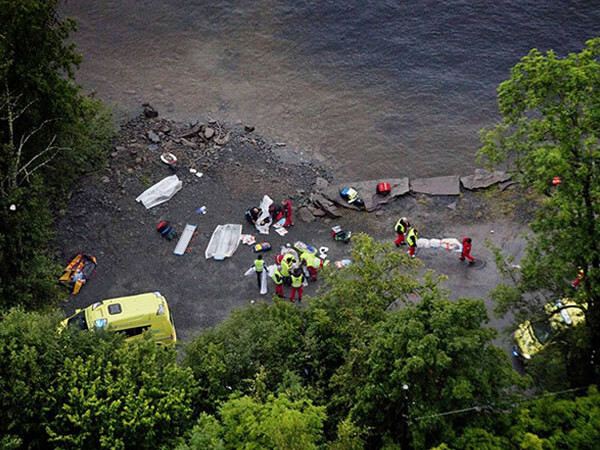 Like everyone watching the news of the violent events in Norway, I was shocked to see the images from Oslo and Utøya. Even more horrified this morning when the full scale of the attack against the youth camp of the Norweigan Labour Party, Arbeiderpartiet, became apparent. Earlier yesterday, before I had seen the images, a Norwegian friend sent me a message on Facebook. The windows of the office block her son works in in central Oslo had been blown out by the blast. He was not there at the time. He had been on a train on his way home to Sandnes in west Norway. When bad things happen it is good to be homeward bound. We like to believe the greatest and most violent acts are carried out by outsiders and the first reports suggested the attacks might be linked to Al Qaeda or Libya. As I write this it is apparent this is clearly not the case; it is more likely to be home-grown Norwegian right wing extremists, or even a lone attacker. I have lived in Norway and studied for a year in Oslo so am particularly shocked at what has happened. They are rightly proud of their country and proud – as Jens Stoltenberg their Prime Minister said yesterday – to say that they want to make the world a better place. Generally less cynical than the British, they have managed to hold that thought and have created a more equal, normally less violent, society. I have met more idealists in Norway than here in the UK. I am not always as idealistic as a Norwegian and obviously not all Norwegians are idealistic. But I like the fact idealism exists and that this means people – and countries – can imagine things being fairer and better than they might otherwise be. So I want Norway to keep its pride and its idealism. But it is clearly a country that has just lost its sense of security and has seen an atrocity carried out of unimaginable scale. Things ‘like that’ do now happen in Norway. But Norwegians are stubborn and they will determinedly work through this, united, and hopefully still with their idealism – if not their innocence – in tact. This morning it is clear that this is the worst act of violence in Norway since the Second World War. My favourite story from Norwegian history is from that time because it demonstrates their national stubbornness. It is this that will get the country through this crisis. Occupied by the Nazis, Norwegians mounted both physical resistance and a psychological war of attrition against their occupiers. This surprised the Nazis because – thinking of blond blue-eyed Norwegians as fairly likely candidates for the Aryan of the year awards – they had apparently thought they would be welcomed. Some (like Quisling) did welcome them but most Norwegians didn’t. One particular form of resistance was for all patriotic Norwegians to wear traditional red knitted hats on a particular day and otherwise go about their business as usual. This might sound funny (and it always makes me smile) but it wound the regime up. The psychological battle was won even though the red hats were banned and the war wasn’t over for some time. The Norwegian Prime Minister, Jens Stoltenberg, gave a moving speech in the aftermath of the attacks. He said everyone needed to care for each other. Norwegians also need to wear their imaginary red hats and remember that irrespective of what comes their way, it is the psychological battle and not just the physical battle they need to win. Then, as well as caring for each other, they will still be strong enough to feel that they can also continue to care for the world. I haven’t looked at this blog for ages. I can’t believe its still going considering hardly anyone ever comments on it. Mind you, considering the vacuousness of this article, I’m not surprised. Well said Fiona – in the wake of such terrible loss it would be all too easy to lose idealism as well. Thanks for the insight Fiona – as soon as I saw the tweets about this, which seem to be well ahead of what the traditional news channels are reporting, I thought of you. Horrendous what’s happened – I hope you’re right and a sense of national determination will show the attacker(s) that violence doesn’t achieve anything. ‘Idealism’ is a concept beyond the comprehension of certain individuals it would seem – in much the same way that humanity, compassion and sympathy patently are also. Personally, I would much rather be vacuous than heartless – especially today. “I dag er vi alle norske. Today we are all Norwegian.” Well said !! I entirely agree Fiona, and our thoughts must be with both the survivers and those who have lost family and friends in these disgraceful attacks. I read in the Observer that the attacker claims to have had discussions with the far right in this country. If this is true, it is more than a bit disturbing; I’ve always known that the English Defense League are fascist thugs, but I hope they don’t start resorting to acts such as this in our country to try and spread their message of hate. And we must stand together with Norwegians and others against all forms of extremism, and I hope such a sentiment enjoys support among all readers of this blog.